The aim of this study was to compare the effect of optimizing lactate clearance versus central venous oxygen saturation (ScvO2) as target goals in early sepsis resuscitation. Optimal goals for quantitative sepsis resuscitation remain uncertain. It is accepted that hemodynamic targets should include a measure of cardiac preload, such as central venous pressure (CVP), and perfusion pressure, such as mean arterial pressure (MAP). A more controversial issue is the method of determining oxygen delivery. Lactate clearance potentially represents a more accessible method to assess tissue oxygen delivery. We conducted a randomized prospective observational cohort study in the ICU, Menoufia University Hospital. Forty patients with severe sepsis or septic shock were divided into two groups: group V, resuscitated to normalize CVP, MAP, and ScvO2of at least 70%; and group L, resuscitated to normalize CVP, MAP, and lactate clearance of at least 10%. The study was continued until goals were achieved or for up to 72 h, whereas mortality was followed up for 28 days. The two groups were matched by demographic and clinical features. As regards lactate clearance in group L, there was a significant difference at hour (h) 6, 12, 24, 48, and 72 compared with h0 (P < 0.05). As regards ScvO2in group V, there was no significant difference compared with h0 at any time. Lactate clearance goal was achieved in 75% of patients in group L, whereas ScvO2goal was achieved in 95% in group V. In group V, 45% of patients died, whereas in group L 30% of patients died, with 15% lower in-hospital mortality (P < 0.05). Lactate clearance was higher in survivors than in nonsurvivors at h6, 12, 24, and 48 (P < 0.05). ScvO2in survivors compared with nonsurvivors showed no significant difference. Lactate clearance during resuscitation is a more powerful indicator of resuscitative adequacy. Lactate clearance was the best parameter associated with 28-day mortality. Protocol of lactate clearance-directed therapy should be considered in septic patients, even after the golden hours. Despite numerous advances in medication, sepsis remains an unconquered challenge. Although outcomes have improved slightly over decades, the unacceptably high mortality for sepsis and septic shock continues . The Surviving Sepsis Campaign international consensus guidelines recommend protocol-driven treatment that uses quantitative resuscitation for emergency department patients with severe sepsis and septic shock . The optimal goals for quantitative resuscitation of sepsis remain uncertain. It is generally accepted that hemodynamic targets should include some measures for the adequacy of cardiac preload, such as central venous pressure (CVP), and perfusion pressure, such as mean arterial pressure (MAP) . A more controversial issue is the method of determining tissue oxygen delivery. Citing a single-center study, the Surviving Sepsis Campaign guidelines recommend the use of central venous oxygen saturation (ScvO2) or mixed venous oxygen saturation to assess the balance of tissue oxygen delivery and consumption . However, since its publication in 2001, a substantial amount of controversy about this single-center study has been generated in the scientific community [5–7]. In addition, published practice surveys have indicated that the time, expertise, and specialized equipment required to measure ScvO2 collectively pose a major barrier to the implementation of protocol-driven quantitative resuscitation programs ,, whereas lactate clearance, derived from calculating the change in lactate concentration from two blood specimens drawn at different times, potentially represents a more accessible method to assess tissue oxygen delivery ,. Elevated lactate levels reflect the total picture of energy metabolism in the acutely stressed patient with sepsis. Elevated blood lactate has long been known to reflect anaerobic metabolism from tissue hypoxia in critically ill patients. However, besides these anaerobic processes, aerobic (metabolic) mechanisms that affect the host's efficiency of energy transfer contribute to lactate production in sepsis ,. In addition, reduced lactate clearance may reflect globally impaired metabolic function by the liver and kidney . Studies have shown that early lactate clearance is associated with improvement in the biomarkers of inflammation and organ dysfunction . Thus, as opposed to ScvO2, which is a rudimentary indicator of only the balance between oxygen supply and demand, lactate clearance biologically reflects more of the general homeostasis of the host and provides more meaningful data about the overall adequacy of the resuscitative processes. In some circumstances the use of ScvO2 might erroneously lead a clinician to believe that the physiologic status of the patient has improved, when in fact it may not have improved. A multicenter study demonstrated that venous hyperoxia (ScvO2>89%) is present in 36% of Emergency Department (ED) patients with septic shock and is associated with an increased risk for death, and, when adjusted for confounders, venous hyperoxia was actually associated with a higher risk for death compared with venous hypoxia (ScvO2, 70%) . In this situation, high ScvO2 values represent either an inability to exchange oxygen because of impaired flow in the small vessels from dysfunctional vascular autoregulatory mechanisms and functional shunting of oxygen or the inability of cells to use the oxygen because of derangement of cellular respiration, so-called 'cytopathic hypoxia' . To address the potential utility of lactate clearance as a substitute for ScvO2, our study was conducted to compare and evaluate the effect of optimizing lactate clearance versus ScvO2 during early hours as target goals of resuscitation among patients with severe sepsis and septic shock. Written consent was obtained from every participant included in this study. The protocol was approved from the Ethical Committee, Faculty of Medicine, Menoufi a University. Our study was conducted as a prospective observational cohort study during the period from January 2014 to June 2015 that enrolled 40 adult critically ill patients through their admission to the ER department at Menoufia University Hospitals after obtaining written informed consent from the enrolled patient or the patient's legally authorized next of kin. All patients were diagnosed with severe sepsis and evidence of hypoperfusion or septic shock. All patients were older than 17 years (27–79 years) with confirmed or presumed infection, two or more systemic inflammatory response criteria and hypoperfusion evidenced by either a systolic blood pressure lower than 90 mmHg after a minimum of 20 ml/kg rapid volume challenge or a blood lactate concentration of at least 36 mg/dl (4 mmol/l). The criteria for exclusion from the study were pregnancy, any primary diagnosis other than sepsis, suspected requirement for immediate surgery within 6 h of diagnosis, an absolute contraindication to chest or neck central venous catheterization, cardiopulmonary resuscitation, or transfer from another institution. All patients were scored using the Sequential Organ Failure Assessment (SOFA)  score and the Simplified Acute Physiology Score (SAPS) II  and monitored by means of heart rate, CVP, pulse oximetry, blood pressure monitoring, and blood gas sampling. All patients had central venous catheter for measuring CVP and ScvO2. Appropriate specimens were taken for culture. Antibiotics were administered as soon as feasible. This was completed in the first 3 h. Thereafter, the patients were randomly assigned to one of the two groups; each consisted of 20 patients. 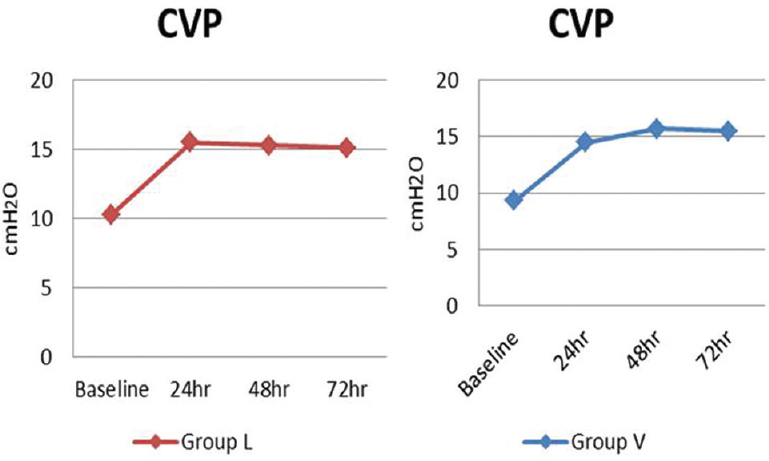 In both groups, isotonic crystalloid was administered in boluses to achieve a CVP of 8 mmHg or higher. Second, the MAP goal of 65 mmHg or higher, if not achieved, was targeted by initiating and titrating vasopressors (dopamine or norepinephrine). Finally, in group V, if the ScvO2 was lower than 70% and the hematocrit was lower than 30%, packed red blood cells were transfused to achieve a ScvO2 goal of 70% or higher. In group L, lactate clearance was targeted instead of ScvO2 to be at least 10%. The lactate clearance is defined by the equation [(lactate initial − lactate delayed)/lactate initial]×100%, for which lactate initial was the measurement at the start of the resuscitation and lactate delayed is another measurement after a minimum of 2 h after resuscitation was initiated. If the lactate clearance was not at least 10% at the first delayed measurement and the hematocrit was less than 30%, packed red blood cells were transfused to achieve a hematocrit of at least 30%. If the lactate clearance remains lower than 10% after the hematocrit was at least 30%, dobutamine will be initiated and titrated in attempts to achieve a lactate clearance of at least 10%. When treatment was continued due to lactate clearance less than 10%, subsequent lactate measurements will be performed at a minimum of 3-h intervals and repeat lactate clearance calculated. Lactate measurement was performed using venous whole blood samples or in blood gases. The lactate clearance goal was achieved when a lactate clearance of at least 10% or if both the initial and delayed lactate concentrations were not elevated (≤18 mg/dl) (2 mmol/l). During the study resuscitation treatment period, the patient's physiological parameters were measured routinely. All data needed to calculate the SAPS II and the SOFA score were collected ,. Central venous oxygen saturation was measured from a central venous blood sample (superior vena cava) collected when patients arrived to the ICU (h0), and then at 6, 12, 24, 48, and 72 h. Survival was followed up for 28 days. Central venous oxygen saturation results were then compared between survivors and nonsurvivors. Serum lactate was measured on admission (h0) and expressed as mmol/l and lactate clearance was calculated at 6, 12, 24, 48, and 72. Survival was followed up for 28 days. 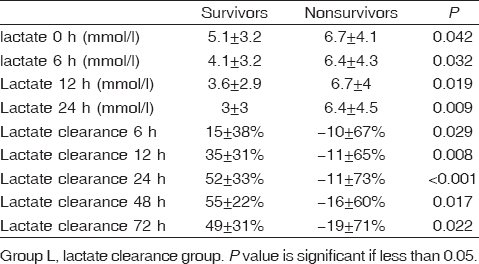 Initial lactate and lactate clearance were then compared between survivors and nonsurvivors. After ICU admission, patients were assessed daily for 72 h and detailed data were collected. Patients were followed up until hospital discharge or 28-day mortality. Mortality rates were recorded and compared between the two groups and then intragroup between survivors and nonsurvivors. The demographic data of the patients included in this study were comparable between the two groups, with no statistically significant difference (P > 0.05). The number of patients according to source of sepsis and comorbidities was comparable between the two groups. Pulmonary infection was the most frequent source of infection, 13 patients (65%) in group L and 15 (75%) in group V [Table 1]. MAP and CVP, at the time of admission, were low in both groups, whereas at 24, 48, and 72 h they showed improvement with a statistically significant difference compared with time of admission within each group (P < 0.05). 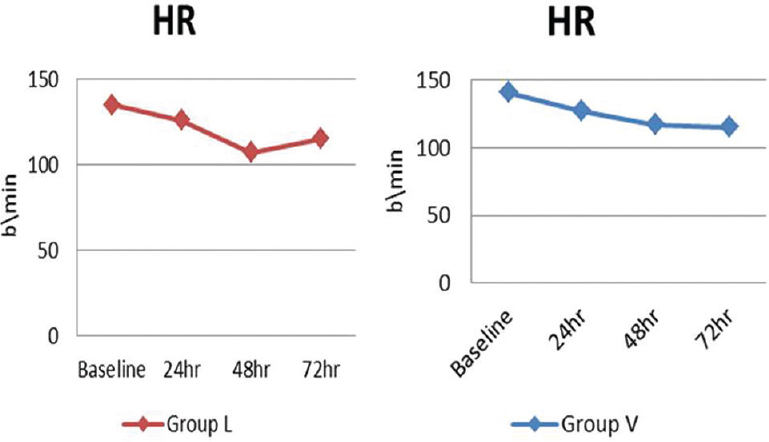 Heart rate at the time of admission was high in both groups, at 24, 48, and 72 h and showed no statistically significant difference with admission time within each group (P > 0.05) [Figure 1], [Figure 2], [Figure 3]. 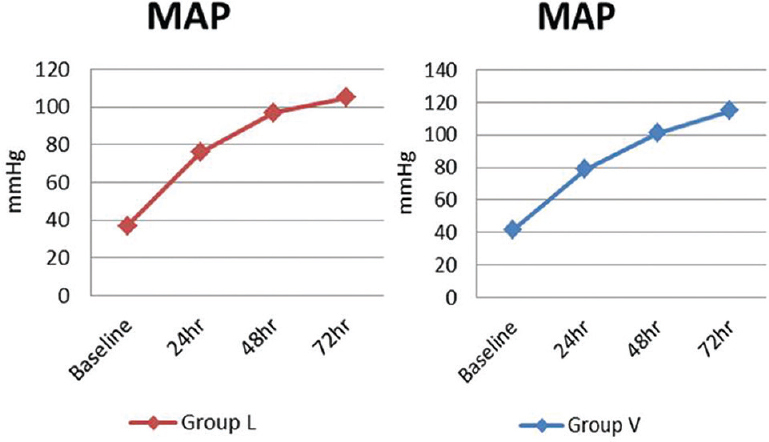 Figure 1: Comparison of mean arterial blood pressure within the same group at different time points during the first 72 h.
Figure 2: Comparison of heart rate within the same group at different time points during the first 72 h.
Figure 3: Comparison of central venous pressure within the same group at different time points during the first 72 h.
There was a statistically significant negative correlation between lactate clearance with the SOFA and the SAPS II score at all times of measurements (P < 0.05); however, there was a nonsignificant negative correlation between ScvO2, SOFA, and SAPS II at any time of measurement (P > 0.05) [Table 2]. 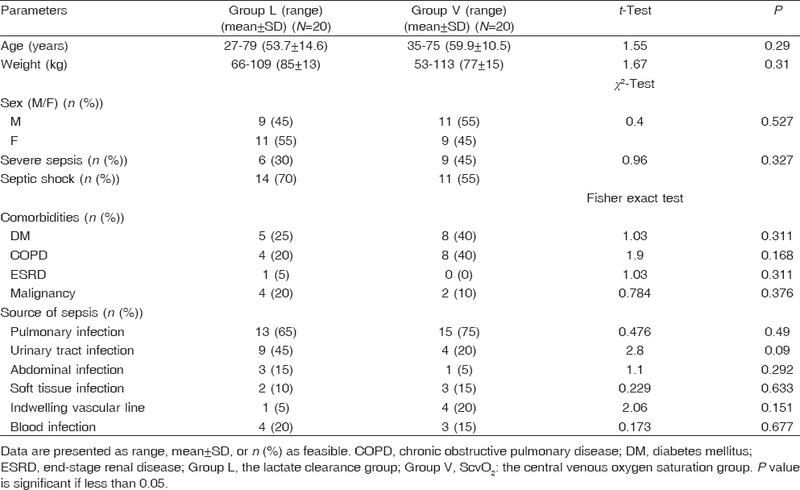 As regards lactate clearance% in group L, there was a statistically significant difference at 6, 12, 24, 48, and 72 h compared with first measurement (P < 0.05) [Table 3]. As regards ScvO2 in group V, there was no statistically significant difference at any time of measurement compared with time of admission (P > 0.05) [Table 4]. Lactate clearance goal was achieved in 75% of patients in group L, whereas ScvO2 goal was achieved in 95% of patients in group V [Table 5]. There was no statistically significant difference between the two groups as regards hospital stay days, ICU in-stay days, and mechanical ventilation-free days (P > 0.05). As regards outcome, there was a statistically significant difference. In group V, 45% of patients died, whereas in group L 30% of patients died, with 15% lower in-hospital mortality (P < 0.05) [Table 6]. The blood lactate and lactate clearance measurements in survivors and nonsurvivors in group L showed a statistically significant difference between h0 lactate value and h6, h12, h24, h48, or h72 lactate value (P < 0.05) for each studied time. The mean blood lactate concentration was lower in survivors than in nonsurvivors at h0 (5.1 ± 3.2 vs. 6.7 ± 4.1 mmol; P < 0.05). Afterward, blood lactate concentrations were lower in survivors than in nonsurvivors at each studied time (4.1 ± 3.2 vs. 6.7 ± 4.3 at h6; 4.1 ± 3.2 vs. 6.4 ± 4.3 at h12; and 3.6 ± 2.9 vs. 6.7 ± 4 at h24; P < 0.05 for each studied time) [Table 7]. Lactate clearance was 15 ± 38% in survivors and − 10 ± 67% in nonsurvivors for the h0–h6 period (P < 0.05) and remained higher in survivors than in nonsurvivors for each studied time (52 ± 33 vs. −11 ± 73%; P < 0.001) for the h0–h24 period [Table 7]. The ScvO2 measurements in survivors compared with nonsurvivors in group V showed no statistically significant difference throughout the different time measurments (P > 0.05) [Table 8]. Severe sepsis and septic shock are leading causes of death in the world . Despite the international recommendation of an early goal-directed therapy , mortality rate remains high in septic shock ,,. There is a need to test the prognostic value of factors that could be used for guiding therapy after the initial resuscitation. The results of this prospective randomized study reported that a protocol targeting lactate clearance of at least 10%, as an evidence of adequate tissue oxygen delivery, is an effective measure of total body oxygen metabolism and is more efficient compared with ScvO2 when resuscitating patients with severe sepsis and septic shock. Moreover, our results indicated the prognostic value of lactate clearance in the first 72 h after resuscitation in the ICU compared with ScvO2. Our results on ScvO2 demonstrated that, although the target goal of ScvO2 of 70% or more was achieved in 90% of patients in group V, 45% mortality was recorded, with no statistically significant difference between survivors and nonsurvivors (P > 0.05) throughout the first 72 h of resuscitation with poor prediction of death. This is in agreement with a study by Jones et al. on 300 septic shock patients; they found that the mortality was higher in patients who benefited from a ScvO2 goal-directed therapy compared with those who were treated using a lactate clearance goal-directed therapy (23 and 17%, respectively). Moreover, this is in agreement with the findings of Fourcade et al. , who studied the hemodynamic target as a visual tool of goal-directed therapy for septic patients and found that ScvO2 is not sufficient as a target goal for resuscitation. Our results demonstrated that target goal of lactate clearance of 10% or more was achieved in 75% of patients in group L. On comparing it with ScvO2 as goals of early sepsis resuscitation, we found that targeting lactate clearance of at least 10%, as evidence of adequate tissue oxygen delivery, is an effective measure of total body oxygen metabolism when resuscitating patients with severe sepsis and septic shock. This is in agreement with the prospective multicenter randomized trial by Dunscombe  on 300 patients with severe sepsis or septic shock, in which CVP and MAP were normalized using crystalloid boluses and vasopressors. Red blood cell transfusion and dobutamine were then used to either achieve a target ScvO2 of greater than 70% or a lactate clearance of 10% within the first 2 h of resuscitation. They concluded that lactate clearance is not inferior to ScvO2 as a goal in early sepsis resuscitation. Our study is in agreement with that obtained by Jones et al. as well, who compared the use of lactate clearance with ScvO2 as the final goal of early sepsis resuscitation and found that lactate clearance of at least 10% at a minimum of 2 h after resuscitation initiation is a valid way and not inferior to assess initial response to resuscitation in severe sepsis . Moreover, this is in accordance with the findings of Jansen et al. , who in their multicenter study on early lactate-guided therapy in ICU patients reported that, in a general ICU population, a 6-h therapy adaptation to lactate clearance reduced the mortality rate in patients with hyperlactatemia compared with standard therapy; a resuscitation adapted to a target of 20% decrease/2 h for 8 h decreased the mortality rate. The value of lactate clearance of 10% had been also confirmed by Arnold et al. in their multicenter observational study of ED patients undergoing resuscitation for severe sepsis, and they reported that it is a viable surrogate marker of resuscitation adequacy in severe sepsis. The present research showed discrepancy between lactate and ScvO2 as regards their correlation with mortality and, as we demonstrated, the target goal of lactate clearance of 10% or more was achieved in 75% of patients in group L, but with a mortality of 30%. Hence, this group had 15% lower in-hospital mortality than those resuscitated to an ScvO2 of at least 70% (30 vs. 45%, respectively), with a statistically significant difference. Moreover, there was a statistically significant difference in blood lactate level and lactate clearance measurements between survivors and nonsurvivors throughout different time intervals during the first 72 h of resuscitation (P < 0.05) and a highly significant difference at 24 h (P < 0.001) compared with the ScvO2 group, which showed no statistically significant difference throughout the different time measurements (P > 0.05), thus indicating the value of lactate clearance as a predictive of mortality compared with ScvO2. These results are supported by Puskarich et al. , who measured lactate clearance and ScvO2 goals simultaneously in the same patients and reported that achievement of the ScvO2 goal only was associated with a mortality rate of 41% (nine of 22), whereas achievement of the lactate clearance goal only was associated with a mortality rate of 8%. 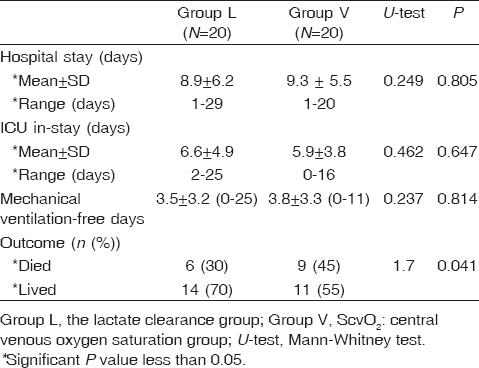 Moreover, in accordance with our study, Marty and colleagues concluded that, during the first 24 h in the ICU, lactate clearance was the best parameter associated with 28-day mortality rate in septic patients. Protocol of lactate clearance-directed therapy should be considered in such patients even after the golden hours . In our study, basal lactate was significantly higher (P < 0.05) in nonsurvivors compared with survivors. This is in agreement with the findings of Smith et al. , who studied lactate as a prognostic indicator on 148 consecutive patients admitted in the ICU and found that basal lactate can be used to predict outcome. Our results showed that lactate clearance measurements were statistically significant in survivors and nonsurvivors throughout different time intervals during the first 6, 12, and 72 h of resuscitation (P < 0.05), whereas it was highly significant at 24 h (P < 0.001). This is in agreement with the findings of Bernardin et al. , who studied arterial lactate level as an early indicator of short-term survival in human septic shock on 32 consecutive patients with septic shock and found that change in arterial blood lactate within the first 24 h of treatment was a strong prognostic indicator of short-term survival in patients with septic shock. Finally, the calculation and interpretation of lactate clearance appeared useful even after the 'golden hours' and enable detection of patients with a high risk for death. We have previously documented a significant degree of technical difficulty associated with the use of computerized spectrophotometric catheters to monitor ScvO2 ,. These devices require equipment and expertise, which are not available in many tertiary care emergency departments ,. The use of ScvO2 monitoring catheters requires preplanned training and real-time calibration and troubleshooting that can divert attention from the patient. We thus submit that the need exists for a simpler and more generalizable method to monitor the adequacy of tissue oxygen delivery as a research imperative in the treatment of patients with severe infection. Our results address this unmet need by providing data that justify the use of lactate clearance instead of continuous ScvO2 monitoring. In this randomized trial, during severe sepsis or septic shock, a protocol that used lactate clearance compared with the use of ScvO2 as the method of measuring total body oxygen metabolism found that lactate clearance of at least 10% at a minimum of 2 h after resuscitation initiation is a valid way to assess initial response to resuscitation in severe sepsis and septic shock. Associative data suggest that lactate normalization during resuscitation is a more powerful indicator of resuscitative adequacy; however, further research on the optimal lactate clearance level to use during resuscitation has yet to be answered. Moreover, assessment of lactate clearance during the first 24 h would be useful for tracking patients who remained at high risk for death despite achievement of recommended early goals determined by international recommendations. Protocols of prolonged lactate clearance-directed therapy should be evaluated in septic patients. As summarized in this study, the best available evidence suggests that if we have to choose a single goal of early sepsis resuscitation, lactate clearance, as opposed to ScvO2, is the more appropriate goal to choose. Further clinical trials are needed to conclusively establish lactate clearance as a resuscitation endpoint and an outcome measure to be targeted during the most proximal phases of severe sepsis and septic shock. Shapiro NI, Howell M, Talmor D. A blue print for sepsis. Acad Emerg Med 2005; 12:352–359. Dellinger RP1, Levy MM, Carlet JM, Bion J, Parker MM, Jaeschke R, Reinhart K, Angus DC, et al. Surviving Sepsis Campaign: international guidelines for management of severe sepsis and septic shock. Crit Care Med 2008; 36:296–327. Hollenberg SM, Ahrens TS, Annane D, Astiz ME, Chalfin DB, Dasta JF, Heard SO, Martin C, et al. Practice parameter for hemodynamic support of sepsis in adult patients: 2004 update. Crit Care Med 2004; 32:1928–1948. Rivers E1, Nguyen B, Havstad S, Ressler J, Muzzin A, Knoblich B, Peterson E, Tomlanovich M. Early Goal-Directed Therapy Collaborative Group. Early goal-directed therapy in the treatment of severe sepsis and septic shock. N Engl J Med 2001; 345:1368–1377. Peake S, Webb S, Delaney A. Early goal-directed therapy of septic shock: we honestly remain skeptical. Crit Care Med 2007; 35:994–995. Benjamin CH Ho, Bellomo R, McGain F, Jones D, Naka T, Wan L, Braitberg G. The incidence and outcome of septic shock patients in the absence of early-goal directed therapy. Crit Care 2006; 10:R80. https://doi.org/10.1186/cc4918. Perel A. Bench-to-bedside review: the initial hemodynamic resuscitation of the septic patient according to Surviving Sepsis Campaign guidelines – Does one size fit all? Crit Care 2008; 12:223. Jones AE, Kline JA. Use of goal-directed therapy for severe sepsis and septic shock in academic emergency departments. Crit Care Med 2005; 33:1888–1889. Carlbom DJ, Rubenfeld GD. Barriers to implementing protocol-based sepsis resuscitation in the emergency department – Results of a national survey. Crit Care Med 2007; 35:2525–2532. Arnold RC1, Shapiro NI, Jones AE, Schorr C, Pope J, Casner E, et al. Multi-center study of early lactate clearance as a determinant of survival in patients with presumed sepsis. Shock 2009; 32:35. Nguyen HB, Rivers EP, Knoblich BP, Jacobsen G, Muzzin A, Ressler JA, Tomlanovich MC. Early lactate clearance is associated with improved outcome in severe sepsis and septic shock. Crit Care Med 2004; 32:1637–1642. Weil MH, Afifi AA. Experimental and clinical studies on lactate and pyruvate as indicators of the severity of acute circulatory failure (shock). Circulation 1970; 41:989-1001. De Backer D. Lactic acidosis. Intensive Care Med 2003; 29:699-702. Pope JV1, Jones AE, Gaieski DF, Arnold RC, Trzeciak S, Shapiro NI. Emergency Medicine Shock Research Network (EMShockNet) Investigators. Multicenter study of central venous oxygen saturation (ScvO2) as a predictor of mortality in patients with sepsis. Ann Emerg Med 2010; 55:40-46. Fink MP. Bench-to-bedside review: cytopathic hypoxia. Crit Care 2002; 6:491-499. Vincent JL, de Mendonça A, Cantraine F, Moreno R, Takala J, Suter PM,et al. Use of the SOFA score to assess the incidence of organ dysfunction/failure in intensive care units: results of a multicenter prospective study. Crit Care Med 1998; 26:1793-1800. Le Gall JR, Lemeshow S, Saulnier F. A new Simplified Acute Physiology Score (SAPS II) based on a European/North American multicenter study. JAMA 1993; 270:2957-2963. Chillet P. The definition and epidemiology of septic shock. Soins 2012; 766:32–33. COIITSS Study Investigators, Annane D, Cariou A, Maxime V, Azoulay E, D'honneur G, Timsit JF, et al. Corticosteroid treatment and intensive insulin therapy for septic shock in adults: a randomized controlled trial. JAMA 2010; 303:341–348. Vincent JL1, Rello J, Marshall J, Silva E, Anzueto A, Martin CD, et al. International study of the prevalence and outcomes of infection in intensive care units. JAMA 2009; 302:2323–2329. Jones AE, Shapiro NI, Trzeciak S, Arnold RC, Claremont HA, BFA, Kline JA. Lactate clearance vs central venous oxygen saturation as goals of early sepsis therapy: a randomized clinical trial. JAMA 2010; 303:739-746. Fourcade O, Marty P, Vallee F. The hemodynamic 'target': a visual tool of goal-directed therapy for septic patients. Clinics (Sao Paulo) 2007; 3:447–454. Dunscombe A. Lactate clearance is not inferior to central venous oxygen saturation as a goal in early sepsis resuscitation. Thorax 2011; 66:127. Jansen TC, van Bommel J, Schoonderbeek FJ, Sleeswijk Visser SJ, van der Klooster JM, Lima AP, et al. Early lactate-guided therapy in intensive care unit patients: a multicenter, open-label, randomized controlled trial. Am J Respir Crit Care Med 2010; 3:752–761. Puskarich MA, Trzeciak S, Shapiro NI, Albers AB, Heffner AC, Kline JA, et al. Whole blood lactate kinetics in patients undergoing quantitative resuscitation for severe sepsis and septic shock. Chest 2013; 143:1548-1553. Marty P, Roquilly A, Vallée F, Luzi A, Ferré F, Fourcade O, Asehnoune K, Minville V. Lactate clearance for death prediction in severe sepsis or septic shock patients during the first 24 hours in Intensive Care Unit: an observational study. Ann Intensive Care 2013; 3:3. Smith I, Kumar P, Molloy S, Rhodes A, Newman PJ, Grounds RM. Base excess and lactate as prognostic indicators for patients admitted to intensive care. Intensive Care Med 2001; 3:74–83. Bernardin G, Pradier C, Tiger F, Mattei M. Blood pressure and arterial lactate level are early indicators of short-term survival in human septic shock. Intensive Care Med 2006; 3:17–25.